This was an interesting season for me. I did not get to many Purdue baseball games, but I seemed to be lucky enough to be at a few good ones. 17. 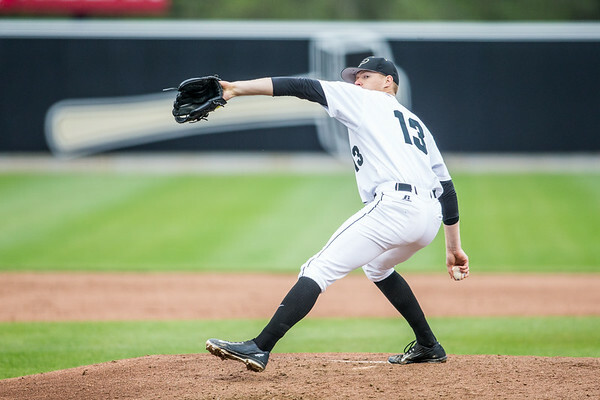 We will start things off with a photo of senior Brian Ghiselli pitching in the Big Ten Tournament. It was fun to see the local kid who played his high school ball in my neighborhood getting a turn in the Big Ten Tournament. He was one of those players that waited for his time in the tournament to come. I wanted to be sure to get a good shot of him for that reason. 16. 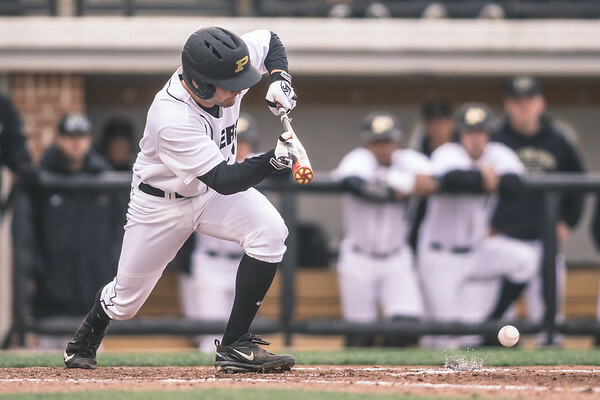 On the flipside of that you have a player like Dalton Parker who came up big in his freshman season for Purdue. Here he celebrates getting out of a jam against Maryland in the Big Ten Tournament. I love these moments when the emotion boils over. 15. This section was one where it was hard to pick a photo so I went with two. At the top you have new baseball coach Mark Wasikowski and new head football coach Jeff Brohm talking before a game. These two men have really restored some hope to Purdue Athletics. 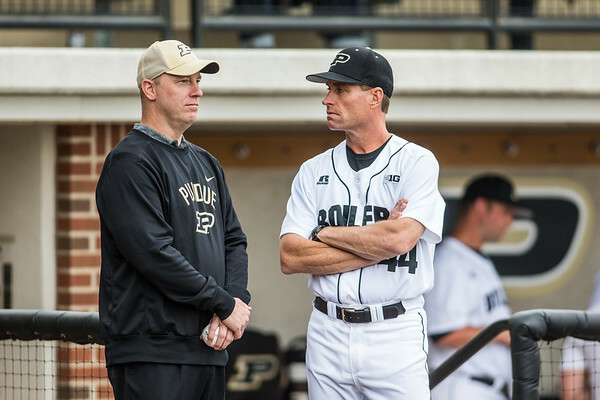 Coach Brohm will be getting his first season under way before we know it, and Coach Waz had a pretty good first season at the helm of the Boilers. 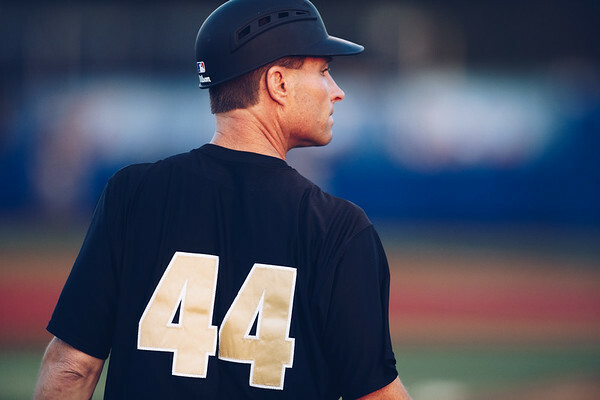 He brought a fun, aggressive form of baseball to West Lafayette that made it fun to head to the ballpark. 14. As a kid of the eighties I appreciate a good chain game, and the next two photos showcase some of that for the Boilers. Here Nick Dalesandro and his chain start to round third and head to home against Indiana State. Nick is a fun player to watch, and he can do many things all over the field. 13. Here is second baseman Evan Warden and his chain. 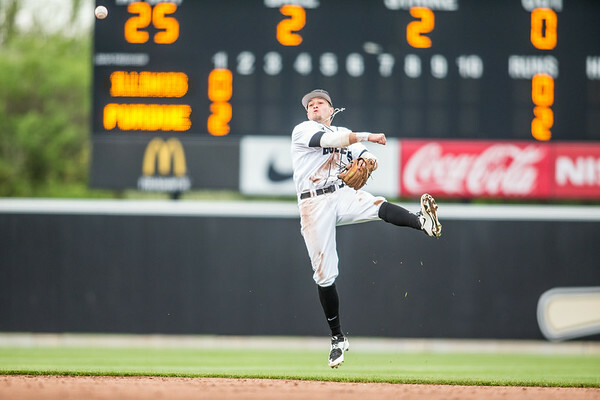 I had the pleasure of watching Evan play before he ever stepped onto the diamond at Purdue. Two seasons ago he pitched and played second for the Kokomo Jackrabbits of the Prospect League. Last season he played for the Lafayette Aviators in the same league. He is a player that reminds me of Nick Charles at Purdue. He will do anything to help his team win. 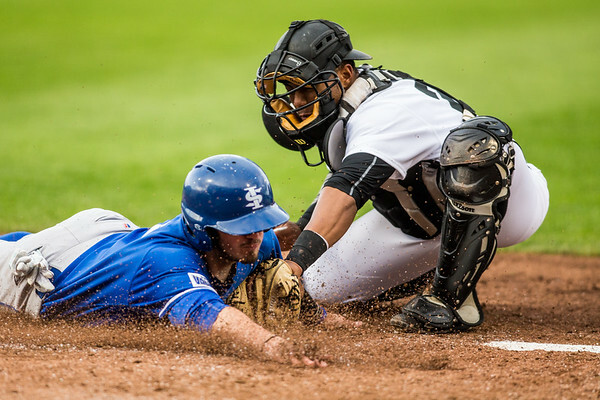 He is usually dirty early, and as he showed this year he is not afraid to get on base after being hit. 12. For most of this season Friday belonged to Tanner Andrews. 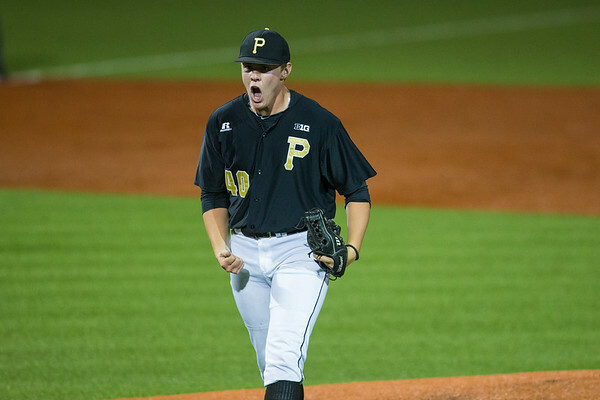 He was the reason that Purdue won a lot of their Friday game with him on the mound. 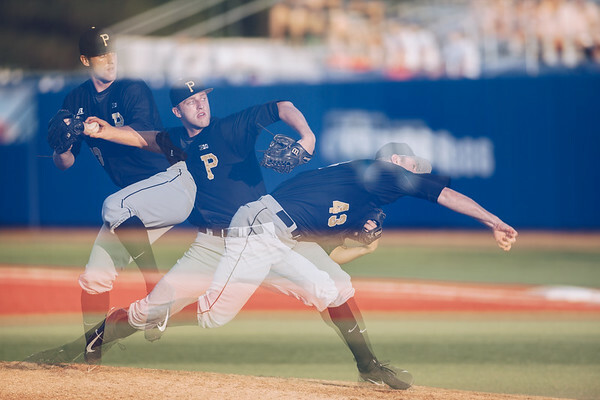 He is also a pitcher that you can photograph from many angles and still make a good image. I liked this one with the hammer in the background. 11. This season was the season of the walk off it seemed like. I saw a couple of them in person. 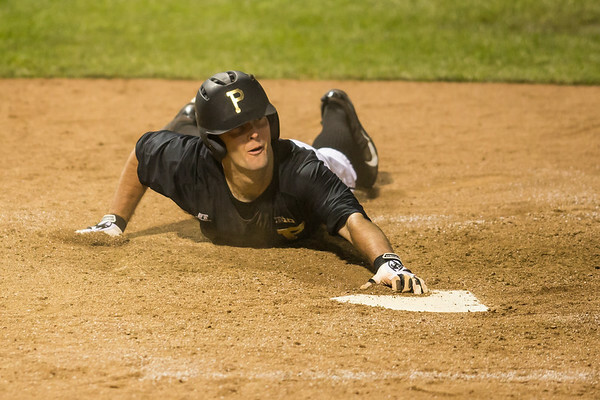 Here Boilermaker infielder Hayden Grant slides home scoring the winning run. I love the way that he is already celebrating as he slides home. 10. The actual walk off celebrations start here with one against St. Louis. At first I was hoping the St. Louis player would get out of the way, but in the end I like the way that it shows the fun of winning against the sadness of losing. 9. Shortstop this season was locked down by Harry Shipley. He is another hard nosed player on this team that seems to do the little things to help the team win. 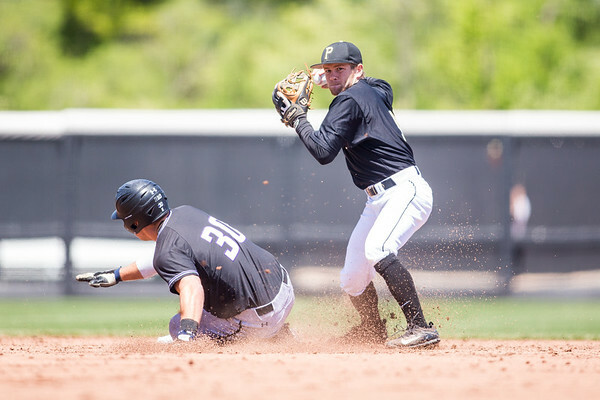 Here he turns a double play against Northwestern. 8. Really? Another multi-exposure? I really did not do many of these this year as I didn’t shoot too much baseball. Usually the multi-exposures come out when I am getting bored. 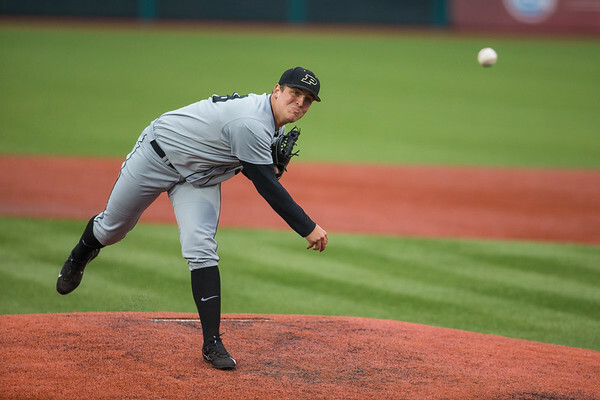 Here the light was right to try it out as Tanner Schumacher pitched against Indiana State. The light and the motion seemed right so I tried it out. I liked the way that it turned out. 7. Twice this season the two teams that I shoot for played each other. Here with a play at the plate I could not lose. Here freshman catcher Bryce Bonner applies the tag to an ISU runner at the plate. I love the dirt flying as the tag is made. 6. 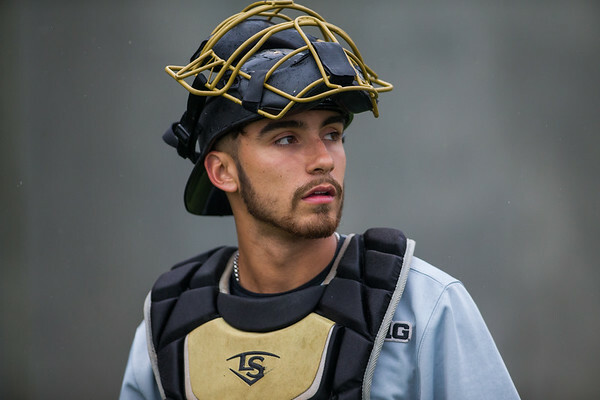 Nick Dalesandro makes another appearance on the countdown this time in his catching gear. I made this photo before the first Purdue game in the Big Ten Tournament. Nick was waiting for the warm ups to start in the bullpen, and I thought that this would be a nice image. 5. This is the second of three straight photos from the first game of the Big Ten Tournament. Here Hunter Wolfe pitches late in the game. I moved down the first base line to get the Big Ten signage in the picture. I love the colors here, and it makes for a good photo. 4. 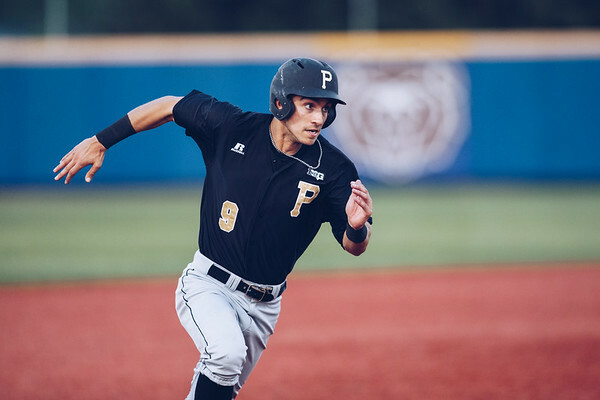 Here Boilermaker freshman Skyler Hunter makes his way to first base late in the first Purdue game of the Big Ten Tournament. The sky really opened up that day, and I think that this photo pretty much sums up that first day very well. 3. Hayden Grant appears on the countdown again, but this time at the plate. I love the way that you can see the chalk flying up from his bunt. It is one of those moments that you don’t see very often, and for that reason it is high up on the countdown. 2. Sometimes the right guy is in the right place at the right time. 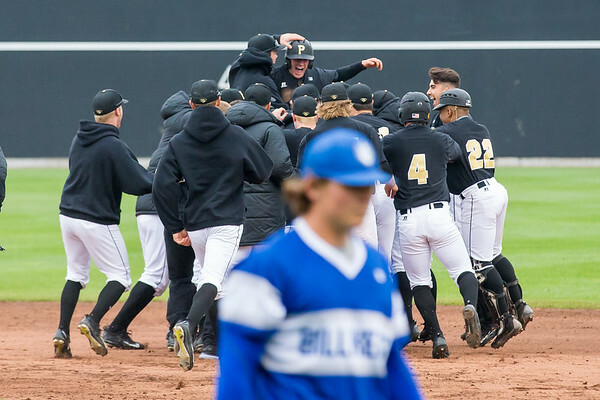 Here Alec Olund is mobbed by his teammates after hitting the walk off late in the season. 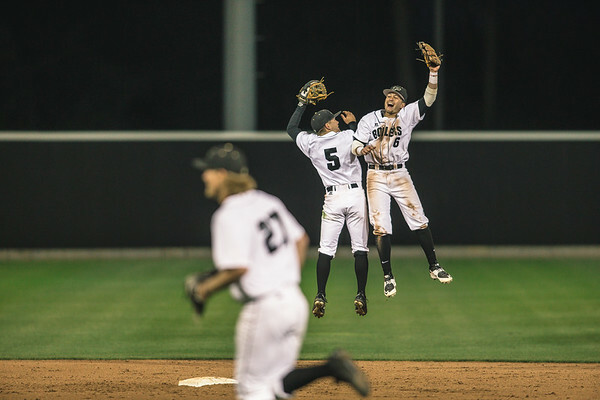 Olund was brought into the game as a defensive replacement, and came through at the plate to win the game for the Boilers. This year the team was much hungrier in those close games, and it resulted in their appearance in the Big Ten Tournament. This is number one for one simple reason. It is a photo with a lot of joy in it. 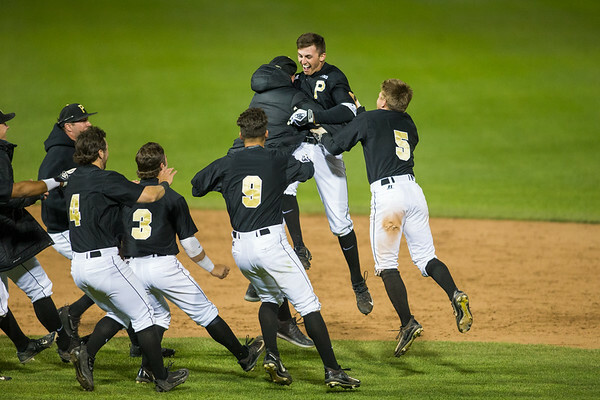 This was a fun season to watch Purdue baseball again. In a way this photo kind of sums that season up. Two of the players that will do anything on the team celebrating a win is a good way to wrap things up. I hope that I get to photograph a lot more of these next year.